With the increasing use of geographical information and technology in a variety of knowledge domains and disciplines, the need to discover and access suitable geospatial data is imperative. This article proposes web search engines (e.g. Google, Bing) as alternative online platforms to spatial data infrastructure for making geospatial data discoverable to users outside the geoinformation community. Most spatial data infrastructures (SDI) provide geoportals as entry points to the SDI through which geospatial data are disseminated and shared. Geoportals are often known in geoinformation communities only, and they present technological challenges for being found by web search engines. In this article, web search engines (e.g. Google, Bing) are proposed as alternative online platforms for discovering geospatial data by those who may not know about a given geoportal or by professionals, academics, experts, and others outside the geoinformation communities who want to use geospatial data in their domains of expertise or practice. Geographic information has become ubiquitous. Every day, people from a variety of knowledge domains and disciplines use geographic information on desktop computers, mobile devices or over the internet (web) to answer questions related to location. These answers provide solutions in transportation planning, logistics, business, environmental monitoring, natural resource management or mining, to name a few. Providing the answers depends on using suitable geospatial data that is ready to be processed, and requires geospatial data to be discoverable and available. Initiatives geared towards making geospatial data available have resulted in the implementation of spatial data infrastructures (SDIs) – a blend of legislation, institutional arrangements (policies), people and technologies to assure the availability, access and sharing of geospatial data . An SDI enables geospatial data producers to share their data in a geoportal for discovery, access and use. Geoportals are web platforms that allow searching for geospatial data and associated metadata. However, business, legal and technological barriers make the geospatial data in a geoportal “invisible” to the general public and to general-purpose web search engines . To discover geospatial data, interested parties have to know where and how to access the geoportal or catalogue web service providing information about data. People in geographic information communities may know this, but what about those outside these communities who want to use geospatial data in their domains of expertise? In response to the technological barriers described above, focused web search engines (crawlers) have been developed with the sole mission of retrieving geospatial resources (services and data) hidden in geoportals. Such efforts are focused on enhancing the web crawler’s capabilities to discover and understand geospatial resources in a geoportal [3, 4], but they do not exploit the ability of geospatial resources to make themselves visible to web search engines. In many cases, these focused crawlers use web pages retrieved by Bing, Google or Yahoo as a starting point for further search refinement . For this reason, in the study described in this article, general purpose web search engines such as Bing and Google are employed as online searching tools or platforms for finding geospatial data of interest. Through a series of empirical tests, the retrieval effectiveness of both Bing and Google was evaluated by preparing HTML web pages with geospatial metadata content that were uploaded to an online server and were later retrieved by both web search engines. The methodology employed and results of these experiments are outlined below. According to the Pew Internet Project, in the US, close to 92% of all activities on the internet involve the use of search engines . An estimated 3-billion searches per day were conducted on Google in 2009; by 2016 the figure has gone up to 5,5-billion . For most people, Google has become not only the first port of entry for information seeking, but the only port of call . An alternative approach to geospatial resource discovery is therefore to publish geospatial metadata contained in geoportals “directly” on the web. To do this, search engine optimisation (SEO) techniques, which are applied in mainstream online information retrieval for enhancing the visibility of web pages in the results of search engines [8 – 11], have been explored for the discovery of geospatial data in this study. Improving the visibility of web pages with geospatial metadata can have a significant impact on the discoverability of geospatial resources. Web page visibility has always been at the forefront in the design and implementation of web search engines. When designing web pages to improve their visibility on the web, various techniques are adopted depending on the type and nature of the information being shared, as well as the kind of business or commercial activity the web page owners are involved in. Commercial organisations often want to increase the visibility of their web pages so that they can reach a wider audience in order to make their businesses successful. They are prepared to pay web search engine companies to favour their web pages by displaying them at the top of search results. Organisations without the means to pay for such services are disadvantaged, therefore major web search engines, such as Google, provide alternative means of enhancing the visibility of web resources . Search results obtained in such a manner are termed “organic”. SEO techniques are recommended for improved visibility of web resources in the organic search category. They are meant to enhance the indexing process of web pages by search engines [8 – 11]. Among others, if web page authors employ SEO techniques, this results in higher web page visibility in response to relevant user queries . Elements that impact the visibility of web pages are related to the metadata structure of the page, its content and the number of hyperlinks pointing to the web page in question [9 – 11, 14, 15]. SEO techniques improve the metadata structure and content of a web page to increase its visibility by web search engines. The number of hyperlinks and the way in which users refine their search query terms are beyond the web publisher’s control . However, the search behaviour of users can be observed (or modelled) to understand how keywords (or key phrases) are employed when searching for information on a particular topic. This information can then be used to fine-tune the metadata structure and content of a web page to further increase its visibility. In this study, geospatial metadata was structured (or infused) inside HTML web pages with geospatial metadata content using two metadata vocabularies: Dublin Core and Schema.org. These HTML web pages were later uploaded onto an online server. The construction and the formulation of the content included in these HTML web pages were guided and informed by the search terms typically employed by users when searching for geospatial data on the web using general-purpose web search engines. The term “vocabulary” refers to both the Dublin Core metadata standard elements, as well as properties or elements in the Schema.org vocabulary. According to the World Wide Web Consortium (W3C), vocabularies “define the concepts and relationships (terms or elements) used to describe an area of concern”. Fig. 1: Overview of the study. The adoption of the Schema.org vocabulary had a major influence on SEO. Schema.org provides a generic set of vocabularies to annotate text content in HTML web pages, thereby infusing semantics or meanings into the web page, i.e. crawlers can “understand” the content of a web page marked up with this vocabulary. Major search engines, such as Google, Bing, Yahoo and Yandex, have endorsed Schema.org and support it . Schema.org provides a number of themes (types) according to which the web page content can be categorised. Categories include products, people, organisations, places, events, cooking recipes, and more. The Schema.org vocabulary is embedded in the page content following certain encoding standards (markup languages), such as microformat, RDFa or microdata. For this study, microdata is used. Dublin Core provides a standard set of elements for describing digital resources on the internet . It has gained popularity due to its international scope and multidisciplinary nature. Over the years, the Dublin Core Metadata Initiative (DCMI) has received criticism due to its inadequacy for describing complex resources and lack of detailed criteria in terms of how elements should be used in the context of local (custom) specific applications; geospatial applications are such an example. Much of the criticism hailed from the library community . 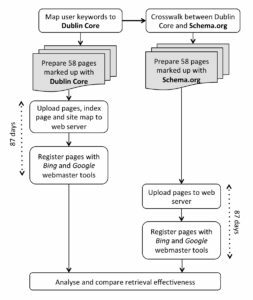 A criticism of concern to our study is that major web search engines do not consider Dublin Core metadata embedded in web pages . Such an assertion has been neither explicitly confirmed nor denied by web search engine owners. The Dublin Core vocabulary was included in this study to serve as baseline in the experiment for comparison with the Schema.org vocabulary, and also due to its popularity. Two sets of 58 HTML web pages were prepared: one set marked up with elements of the Dublin Core metadata standard and the other with properties of types defined in the Schema.org vocabulary (see Fig. 1). The page content (geospatial metadata) in the two sets was identical. There was also an index page for each set, containing a direct link to each of the other 58 pages. The first set of pages, marked up with Dublin Core, was uploaded to a web server exposed on a public domain (internet) so that these pages could be “crawled” (i.e. indexed) by search engine robots. The web server and the set of pages were registered with both Google and Bing via their respective webmaster tools. This ensures that search engines include the pages in their indexes, i.e., the pages are searchable. Furthermore, a sitemap (in XML format with a list of URL hyperlinks to the 58 pages in the set) was uploaded onto the web server and registered with each of the web search engines via their respective webmaster tools applications. The submission of sitemaps to web search engines is recommended as an SEO indexing technique because it enhances the crawling process. 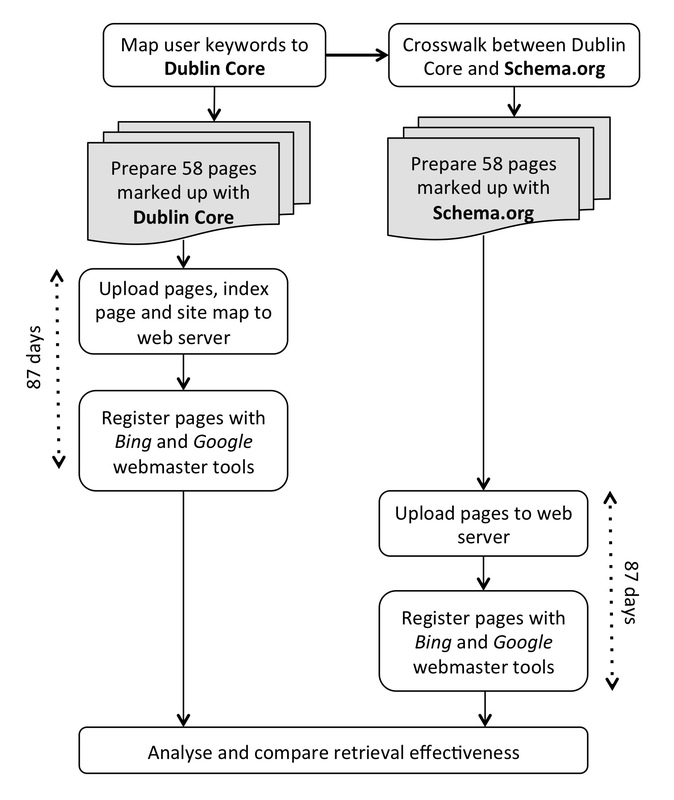 After a period of 87 days (6 July 2014 to 1 October 2014), the Dublin Core pages were replaced with the second set of pages, marked up with Schema.org, and these were then also registered with the Google and Bing webmaster tools. Results for this second set of pages were also collected for a period of 87 days (23 November 2014 to 18 February 2015). Fig. 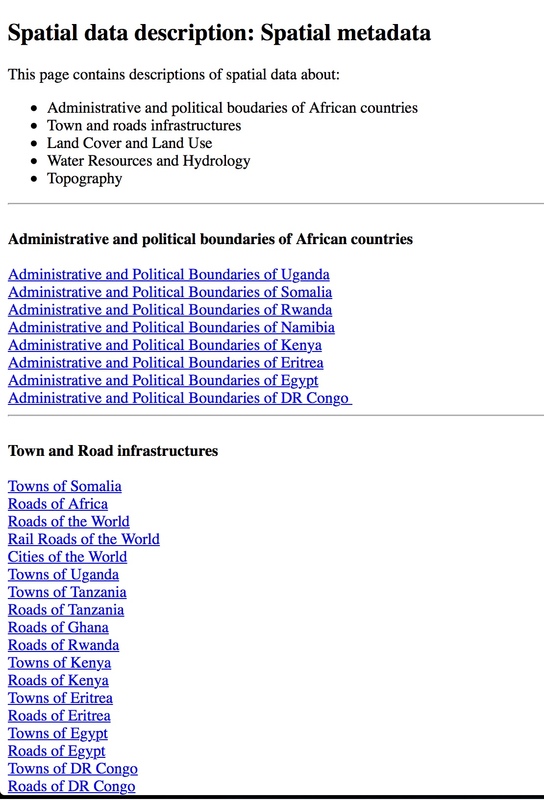 2 illustrates an HTML web page with geospatial metadata content used in the experiments. Fig. 2: HTML web page with geospatial metadata content marked up with Dublin Core/Schema.org vocabularies. Furthermore, the webmaster tools provided reports with information about page traffic, crawl information and search keywords (queries) that triggered appearances of the pages in the search results of respective search engines, the number of pages that were retrieved, the number of times a page appeared in a search engine result (impressions) and the average position (rank) of a page in the list of search engine results. The number of pages that were retrieved and rank statistics were analysed to evaluate retrieval effectiveness of the web search engines. Because the retrieval effectiveness of the marked-up pages could be influenced by how the web search engines (Bing and Google) recognise and interpret the vocabularies (Dublin Core and Schema.org), we verified if and how each search engine recognised the two kinds of vocabularies. The “Markup Validator” in Bing webmaster tools and the “Structured Data Testing Tool” of Google webmaster tools were employed. At the time of testing, Bing did not identify any tags in the pages marked up with Dublin Core vocabulary using the “meta” tag. The capabilities of the search engines to recognise and interpret the vocabularies were considered when the results were analysed. Relevance-based (“Recall”) and ranking-based (“Rank”) evaluation measures have been used to assess retrieval effectiveness. Recall describes the ratio of the number of relevant pages retrieved (in the search results) to the total number of relevant pages in the web server (58 for this research). Rank describes the average position of a page (URL) in the search results. The lower the average position, the higher its rank and visibility. As illustrated in Table 1, 49 of the 58 pages marked up with Dublin Core appeared in the search results of Google and 15 pages appeared in the search results of Bing. This amounts to a recall of 0,84 for Google, and 0,26 for Bing. Hence, it can be said that relevance-based retrieval effectiveness of pages marked up with Dublin Core is higher with Google than with Bing. This can be explained by the fact that Bing did not recognise the Dublin Core markup. Another explanation could be that Google achieved a higher recall because it is used by more people. Furthermore, 45 of the 58 pages marked up with Schema.org appeared in the search results of Google and 39 in the search results of Bing. This amounts to a recall of 0,78 for Google and 0,67 for Bing. Again, relevance-based retrieval effectiveness of pages marked up with Schema.org is higher with Google than with Bing, despite both search engines detecting the Schema.org vocabulary. Table 1: Relevance-based retrieval effectiveness. When comparing the relevance-based retrieval effectiveness of the two vocabularies, it can be seen that in Bing, pages marked up with Dublin Core had lower recall values than those marked up with Schema.org (0,26 vs 0,67). In contrast, in Google, pages marked up with Dublin Core achieved a higher recall than those marked-up with Schema.org (0,84 vs 0,78). It should be noted that for both search engines and both vocabularies, some pages never appeared in any of the search results. Table 2 shows that for both vocabularies the ranking is generally higher (i.e. lower average position) in Google than in Bing. The difference in ranking between the two search engines is more significant for Dublin Core (163,1 for Google vs 744,5 for Bing). In Google, the ranking is generally higher (i.e. lower average position) for pages marked up with Dublin Core (163,1 vs 227,1); while the opposite was observed for Bing where the ranking is generally higher for pages marked up with Schema.org (744,5 vs 338,2). The latter can again be explained by the fact that Bing did not recognise the Dublin Core markup. An overview of the retrieval effectiveness evaluation is presented in Table 3. Table 3: Summary of relevance-based and ranking-based retrieval effectiveness. The research presented in this paper demonstrates, through an empirical study, how SEO techniques can be leveraged to improve the visibility and discoverability of geospatial data or resources on the web. The research emanates from the need to find solutions for current impediments to the discovery of geospatial resources in geoportals. By documenting HTML web pages with geospatial metadata content and exposing such web pages to web search engines, the discovery of geospatial resources is enhanced for mainstream information retrieval by general-purpose web search engines. Overall, the results indicate that Google was more effective in retrieving the pages than Bing; and pages marked up with Schema.org were more effectively retrieved than those marked up with Dublin Core. The research also demonstrates how search terms can be identified and used to infuse metadata according to the Dublin Core and Schema.org vocabularies into web pages; and how, along with the registration of the pages for indexing, the discovery of geospatial resources by general purpose web search engines can be enhanced. The research contributes to online information retrieval generally by demonstrating the application of SEO techniques in the geospatial domain. The retrieval effectiveness evaluation presented in this paper helps to understand if and how search engines detect and index geospatial metadata embedded in web pages. The approach presented in this paper comes not as a way of replacing geoportals, but rather as a means of complementing geoportals to achieve their intended goal. 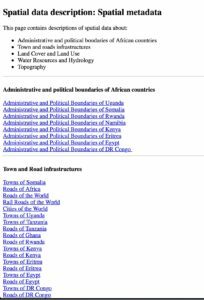 Publishing geospatial metadata in HTML web pages increases web traffic to geoportals where the relevant geospatial data can be further explored, accessed or downloaded by all interested parties, whether GIS practitioners or not. This can be described with an analogy of an iceberg: geoportals of today are massive icebergs concealed below the surface of the sea of web resources. The approach described in this paper reveals the tip of the iceberg for further exploration underneath the surface. This is a summary of the paper published in the ISPRS International Journal of Geo-Information (IJGI): Katumba and Coetzee S (2017). Employing Search Engine Optimization (SEO) Techniques for Improving the Discovery of Geospatial Resources on the Web. IJGI, 6(9): 284-304. D Nebert, Ed. Developing Spatial Data Infrastructures: The SDI Cookbook, Version 2.0, 2004. Available online: http://gsdiassociation.org/images/publications/cookbooks/SDI_Cookbook_GSDI_2004_ver2.pdf (accessed on 1 June 2017). JF Lopez-Pellicer; R Béjar; F Zarazaga-Soria. Providing Semantic Links to the Invisible Geospatial Web. In Notes in Geoinformatics Research, 1st ed. ; Prensas Universitarias de Zaragoza: Zaragoza, Spain, 2012. C Huang; H Chang. GeoWeb Crawler: An Extensible and Scalable Web Crawling Framework for Discovering Geospatial Web Resources. ISPRS Int. J. Geo-Inf. 2016, 5, 136. K Purcell. Search and Email Still Top the List of Most Popular Online Activities: Two Activities Nearly Universal among Adult Internet Users, Pew Research Center’s Internet & American Life Project, 2011. Available online: http://www.pewinternet.org/2011/08/09/search-and-email-still-top-the-list-of-most-popular-online-activities (accessed on 4 May 2017). M McGee. By the Numbers: Twitter vs. Facebook vs. Google Buzz, Search Engine Land, 2010. Available online: http://searchengineland.com/by-the-numbers-twitter-vs-facebook-vs-google-buzz-36709 (accessed on 1 March 2015). K Cahill; R Chalut. Optimal Results: What Libraries Need to know about Google and Search Engine Optimization. Ref. Libr. 2009, 50, 234 – 247. E Ochoa. An Analysis of the Application of Selected Search Engines Optimization (SEO) Techniques and their Effectiveness on Google’s Search Ranking Algorithm. Master’s Thesis, California State University, Long Beach, CA, USA, May 2012. P Swati; BV Pawar; AS Patil. Search Engine Optimization: A study. Res. J. Comput. Inf. Technol. Sci. 2013, 1, 10 – 13. D Onaifo; D Rasmussen. Increasing libraries’ content findability on the web with search engine optimization. Libr. Hi Tech 2013, 31, 87 – 108. R Mustafa; MS Naawaz; MI Lali. Search engine optimization techniques to get high score in SERP’s using recommended guidelines. Sci. Int. 2015, 27, 5079 – 5086. Meta Tags that Google Understands. Available online: https://support.google.com/webmasters/answer/79812?hl=en (accessed on 22 December 2014). RA Malaga. Search Engine Optimization-Black and White Hat Approaches. Adv. Comput. 2010, 78, 1 – 39. J Zhang; A Dimitroff. The impact of webpage content characteristics on webpage visibility in search engine results (Part I). Inf. Process. Manag. 2005, 41, 665 – 690. J Zhang; A Dimitroff. The impact of metadata implementation on webpage visibility in search engine results (Part II). Inf. Process. Manag. 2005, 41, 691 – 715. J Krutil; M Kudelka; V Snasel. Web page classification based on Schema.org collection. In Proceedings of the Fourth International Conference on Computational Aspects of Social Networks (CASoN), Sao Carlos, Brazil, 21 – 23 November 2012. Dublin Core Metadata Initiative. Available online: http://dublincore.org/ (accessed on 15 November 2013). CA Harper. Dublin Core Metadata Initiative: Beyond the element set. Inf. Stand. Q. Winter 2010, 22, 1. Available online: http://www.niso.org/publications/isq/free/FE_DCMI_Harper_isqv22no1.pdf (accessed on 1 June 2017). J Beall. The Death of Metadata. Ser. Libr. 2008, 51, 55–74.